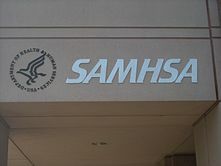 The Substance Abuse and Mental Health Services Administration (SAMHSA; pronounced /ˈsæmsə/) is a branch of the U.S. Department of Health and Human Services. It is charged with improving the quality and availability of treatment and rehabilitative services in order to reduce illness, death, disability, and the cost to society resulting from substance abuse and mental illnesses. The Administrator of SAMHSA reports directly to the Secretary of the U.S. Department of Health and Human Services. SAMHSA's headquarters building is located outside of Rockville, Maryland. Congress directed SAMHSA to target effectively substance abuse and mental health services to the people most in need and to translate research in these areas more effectively and rapidly into the general health care system. Charles Curie was SAMHSA's Director until his resignation in May 2006. In December 2006 Terry Cline was appointed as SAMHSA's Director. Dr. Cline served through August 2008. Rear Admiral Eric Broderick served as the Acting Director upon Dr. Cline's departure, until the arrival of the succeeding Administrator, Pamela S. Hyde, J.D. in November 2009. She resigned in August 2015 and Kana Enomoto, M.A. served as Acting Director of SAMHSA until Dr. Elinore F. McCance-Katz was appointed as the inaugural Assistant Secretary for Mental Health and Substance Abuse. The title was changed by Section 6001 of the 21st Century Cures Act. SAMHSA's mission is to reduce the impact of substance abuse and mental illness on American's communities. The Center for Mental Health Services (CMHS) focuses on prevention and treatment of mental disorders. The Center for Substance Abuse Prevention (CSAP) seeks to reduce the abuse of illegal drugs, alcohol, and tobacco. The Center for Substance Abuse Treatment (CSAT) supports effective substance abuse treatment and recovery services. The Center for Behavioral Health Statistics and Quality (CBHSQ) collects, analyzes, and publishes behavior health data. The Center for Mental Health Services leads federal efforts to promote the prevention and treatment of mental disorders. Congress created CMHS to bring new hope to adults who have serious mental illness and children with emotional disorders. As of March 2016[update], the director of CMHS is Paolo del Vecchio. CMHS is the driving force behind the largest US children's mental health initiative to date, which is focused on creating and sustaining systems of care. This initiative provides grants (now cooperative agreements) to States, political subdivisions of States, territories, Indian Tribes and tribal organizations to improve and expand their Systems Of Care to meet the needs of the focus population—children and adolescents with serious emotional, behavioral, or mental disorders. The Children's Mental Health Initiative is the largest Federal commitment to children’s mental health to date, and through FY 2006, it has provided over $950 million to support SOC development in 126 communities. The Center for Substance Abuse Prevention (CSAP) aims to reduce the use of illegal substances and the abuse of legal ones. CSAP promotes self-esteem and cultural pride as a way to reduce the attractiveness of drugs, advocates raising taxes as a way to discourage drinking alcohol by young people, develops alcohol and drug curricula, and funds research on alcohol and drug abuse prevention. CSAP encourages the use of "evidence-based programs" for drug and alcohol prevention. Evidence-based programs are programs that have been rigorously and scientifically evaluated to show effectiveness in reducing or preventing drug use. The current director of CSAP is Frances Harding. CSAP was established in 1992 from the previous Office of Substance Abuse Prevention by the law called the ADAMHA Reorganization Act. Defining regulations include those of Title 42. To improve the lives of individuals and families affected by alcohol and drug abuse by ensuring access to clinically sound, cost-effective addiction treatment that reduces the health and social costs to our communities and the nation. CSAT works with States and community-based groups to improve and expand existing substance abuse treatment services under the Substance Abuse Prevention and Treatment Block Grant Program. CSAT also supports SAMHSA’s free treatment referral service to link people with the community-based substance abuse services they need. Because no single treatment approach is effective for all persons, CSAT supports the nation's effort to provide multiple treatment modalities, evaluate treatment effectiveness, and use evaluation results to enhance treatment and recovery approaches. The current director of CSAT is Kimberly Johnson, Ph.D. The Center's headquarters are outside of Rockville, Maryland. Connecticut, Massachusetts, Maine, New Hampshire, Rhode Island and Vermont. New York State, New Jersey, U.S. Virgin Islands and Puerto Rico. Delaware, Maryland, Pennsylvania, Virginia, West Virginia and the District of Columbia. Alabama, Florida, Georgia, Kentucky, Mississippi, North Carolina, South Carolina and Tennessee. Illinois, Indiana, Michigan, Minnesota, Ohio and Wisconsin. Arkansas, Louisiana, New Mexico, Oklahoma and Texas. Colorado, Montana, North Dakota, South Dakota, Utah, and Wyoming. Arizona, California, Hawaii, Nevada, American Samoa, Guam, and the Northern Marina Islands. Trauma and Justice – Reduce the pervasive, harmful, and costly public-health impacts of violence and trauma by integrating trauma-informed approaches throughout health and behavioral healthcare systems; also, to divert people with substance-abuse and mental disorders away from criminal-/juvenile-justice systems, and into trauma-informed treatment and recovery. Military Families – Active, Guard, Reserve, and Veteran – Support of our service men & women, and their families and communities, by leading efforts to ensure needed behavioral health services are accessible to them, and successful outcomes. Health Reform – Broaden health coverage and the use of evidence-based practices to increase access to appropriate and high quality care; also, to reduce existing disparities between: the availability of substance abuse and mental disorders; and, those for other medical conditions. Health Information Technology for Behavioral Health Providers – To ensure that the behavioral-health provider network—including prevention specialists and consumer providers—fully participate with the general healthcare delivery system, in the adoption of health information technology. Data, Outcomes, and Quality – Demonstrating Results – Realize an integrated data strategy that informs policy, measures program impact, and results in improved quality of services and outcomes for individuals, families, and communities. Public Awareness and Support – Increase understanding of mental and substance abuse prevention & treatment services, to achieve the full potential of prevention, and, to help people recognize and seek assistance for these health conditions with the same urgency as any other health condition. Their budget for the Fiscal Year 2010 was about $3.6 billion. It was re-authorized for FY2011. Most recently, the FY 2016 Budget requests $3.7 billion for SAMHSA, an increase of $45 million above FY 2015. In February 2004, the administration was accused of requiring the name change of an Oregon mental health conference from "Suicide Prevention Among Gay/Lesbian/Bisexual/Transgender Individuals" to "Suicide Prevention in Vulnerable Populations." In 2002, then-President George W. Bush established the New Freedom Commission on Mental Health. The resulting report was intended to provide the foundation for the federal government's Mental Health Services programs. However, many experts and advocates were highly critical of its report, Achieving the Promise: Transforming Mental Health Care in America. ^ "Records of the Alcohol, Drug Abuse, and Mental Health Administration [ADAMHA]". National Archives. U.S. National Archives and Records Administration. Retrieved 18 July 2012. ^ "Who We Are". SAMHSA. 4 March 2016. ^ "Rear Admiral Eric Broderick, D.D.S., M.P.H., United States Public Health Service: Deputy Administrator of SAMHSA". SAMHSA. 30 November 2010. Archived from the original on 17 February 2012. ^ "Pamela S. Hyde, J.D. : Administrator, Substance Abuse and Mental Health Services Administration; United States Department of Health and Human Services". SAMHSA. 30 November 2010. Archived from the original on 13 February 2013. ^ "Farewell from the SAMHSA Administrator". SAMHSA News. 12 August 2015. ^ "Joint Meeting of the SAMHSA National Advisory Council (NAC), Center for Mental Health Services (CMHS) NAC, Center for Substance Abuse Prevention (CSAP) NAC, Center for Substance Abuse Treatment (CSAT) NAC, SAMHSA Advisory Committee for Women's Services, and SAMHSA Tribal Technical Advisory Committee Public Agenda" (PDF). SAMHSA. 27 August 2015. ^ "PN608 — Elinore F. McCance-Katz — Department of Health and Human Services". Congress.gov. 3 August 2017. ^ a b c "Offices and Centers". SAMHSA. 11 September 2014. ^ "Agency Overview". SAMHSA. 13 August 2010. Archived from the original on 14 March 2012. ^ a b "Center for Mental Health Services". SAMHSA. 29 March 2016. ^ "SAMHSA's Eight Strategic Initiatives". Archived from the original on 24 October 2010. ^ Crea, Joe (25 February 2005). "Suicide prevention workshop retains 'gay' title". Washington Blade. Archived from the original on 28 August 2008. ^ "National Briefing — Northwest: Oregon: Workshop's Original Title Restored". The New York Times. 26 February 2005. "National Institute of Mental Health: Important Events in NIMH History". National Institutes of Health. Archived from the original on 5 July 2015. "Substance Abuse and Mental Health Services Administration: Justification of Estimates for Appropriations Committees: Fiscal Year 2011" (PDF). Department of Health and Human Services. Archived from the original (PDF) on 21 October 2013. Associated Press (26 February 2005). "Federal agency caught in uproar over workshop title". The Advocate. Regent Entertainment Media Inc. Archived from the original on 17 October 2008.